Instant wellness and comfort right in your own home. We love the traditional Finnleo Sauna, the PS44 Sauna. Use it wet or dry, with the option of steam or dry heat. 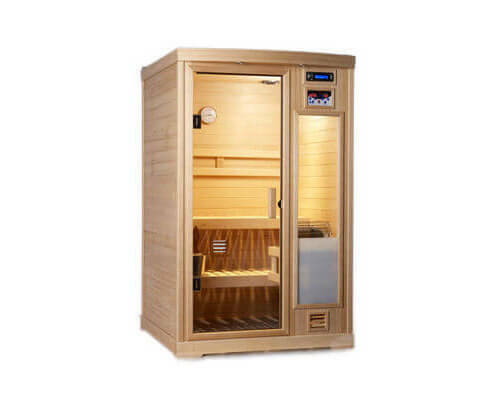 The PS44 Sauna comes with an AM/FM/CD Stereo System with heat-resistant speakers and color therapy lighting. It is portable and can be assembled in a matter of minutes with Finnleo’s exclusive latching system. Simply pop it together, plug it into a standard 15 amp outlet and start sweating! Measures 4’x4′. Stop by or contact us using the form below to learn more today! A few minutes a day is all it takes for you to feel better in a Finnleo Sauna. It’s well documented that sauna bathing comes with many health benefits. A deep, healthy sweat is invigorating, tension fades, muscles unwind, and you emerge relaxed. Stress reduction is a major benefit of sauna use. Heat bathing in a sauna provides stress relief in a number of ways. It’s a warm, quiet space without any distractions coming from the outside. And, the heat from the sauna relaxes the body’s muscles, improves circulation and stimulates the release of endorphins – the body’s all-natural “feel good” chemical. The endorphins released by your body during sauna bathing can minimize the pain of arthritis and muscle soreness other from an intense physical workout. Body temperature also rises from the heat of the sauna.. This causes blood vessels to dilate, therefore increasing blood circulation. This increased blood flow in turn speeds up the body’s natural healing process via soothing aches and pains. After participating in physical sports, use a sauna to promote muscle relaxation. Heat bathing is an old beauty trick. When the body begins to produce sweat via deep sweating, the skin is then cleansed and dead skin cells are replaced – keeping your skin in good working condition.Sweating rinses bacteria out of the epidermal layer and sweat ducts. Bathing skin in sweat on a fairly regular basis can deter the collagen breakdown that results in wrinkles. While sauna usage is not a cure for acne, it can help due to the deep cleansing it provides from a deep sweat. Research has shown that a deeper, more relaxed sleep can result from sauna use. The calming heat of the sauna can help lower body temperatures to induce a deeper sleep. In addition, saunas can reduce the incidences of colds and flu. As your body is exposed to the sauna’s heat and steam, it produces white cells rapidly, helping fight illness and kill viruses. Saunas can also relive sinus congestion from colds and allergies especially when used with steam. Not sure how a new sauna fits in your budget? Check out our financing options to make your backyard dreams come true.